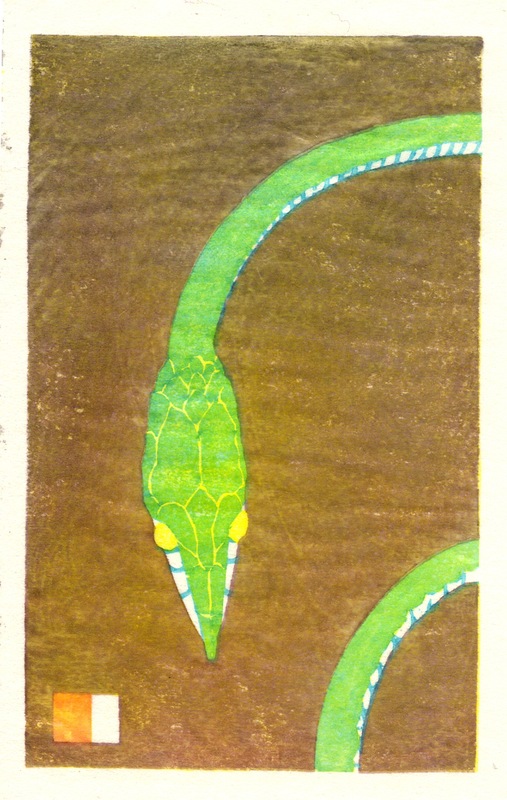 Vine Snake; proof state. Moku Hanga woodblock print. I had rather optimistically brought my tool box and brushes with me when I came back to Santa Cruz this month. I'm working in the local Urgent Care clinic as they're still short. It's flu season so they're really busy and between working, charting, sleeping and other sundry tasks and obligations I wasn't really sure I'd have time. But I did have one block of cherry plywood from my favorite wood block art supplier McClains. At 8 x 10" it was perfect for my little postcard-sized snake print as I could get two plates off each side; two in cherry and two off the birch ply that makes up the back. 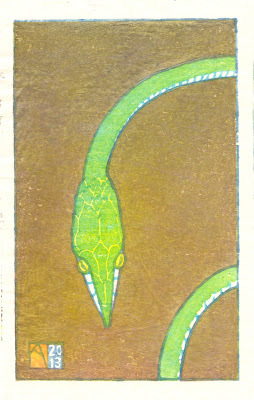 YEAR of the SNAKE card. The "mouse" brown I wanted for the background is more of a crap brown and has to be changed but registration and carving are good enough. I can't decide about another block though. 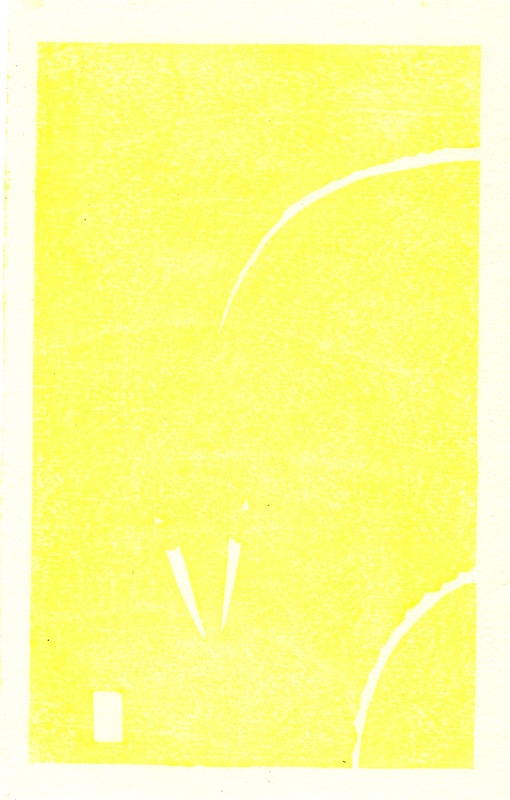 I think the background--effective in that, "this is a Japanese-style woodblock so open space is ok" look but I'm thinking of cutting and printing a subtle leaf pattern/vine/scroll thing to the background. 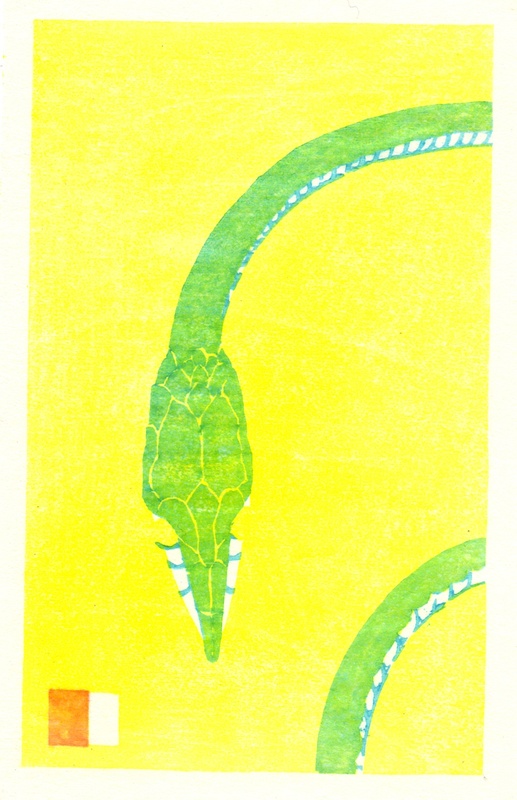 Since this is a VINE snake and lives in the jungle/brush it would certainly be species-appropriate. I think I will try to carve and proof one more block if I have time. I still have two shifts in the clinic and I head home next week.I definitely will NOT have time to print the edition before I leave so once again I'll be tossing blocks, brushes and tools in my suitcase on my trip back to Florence--where I'll still have distractions but hopefully not so many as to keep me from printing 100 little green slender serpents!